that ensures your information is totally safe. who handles all transactions details. Your private data is 100% safe. Something went wrong with your payment. These Terms of Service ("Terms") provide that its users ("users" or "users", if applicable) access, browse and use the Website; download and use the content owned by Lovepik; and services provided through the Website ("Services" or " Service" as applicable. Lovepik may modify the terms at any time, so we recommend that users review the terms periodically. The date of commencement of this clause refers to the latest update of these terms, which will apply from the date of publication. Similarly, privacy policies will apply to the collection and processing of personal data. Through the website, users can search for visual content in any format ("content"), such as vectors and illustrations, photos and images, PNG and Photoshop files, and specific information related to such content. Users only have the right to use this site and services based on terms and integrity. Users do not interfere with the functionality of the site or service, and in particular do not impersonate other users or individuals. The user agrees not to take any actions that may damage, unusable, overload, deteriorate or impede the normal use of the site or service, which may affect the security of the site or service, or may interfere in any way with the services provided by Lovepik. Prohibit the use of robots, spiders or any other mechanism, mobile application, program or tool in any way to access, copy or control any part of the website or service, which violates the normal use of this website or infringement of Lovepik without the explicit prior authorization of Lovepik . Similarly, the use of any method or system not expressly authorized by Lovepik to obtain or attempt to obtain the content of this website is prohibited, or it is not a normal method of accessing this website. The user is responsible for ensuring that the function of the service meets the needs of the user before using the service and has all the requirements for the purpose, equipment and software, and any fees for using the service. The rights granted to users pursuant to these terms are personal and may not be transferred in whole or in part to any third party (including affiliates or entities belonging to the same group company) without prior, express and written consent to Lovepik. In order to use certain services, the user must register, create a username and password, and activate the account. To do this, the user must provide a valid email address and the user will receive a notification about the service. The user agrees to provide the mandatory information required for registration and acknowledges that the information is true, complete and up-to-date. The user is solely responsible for keeping this information updated. If the user provides false, obsolete or incomplete information, or Lovepik has reason to doubt it, Lovepik reserves the right to suspend or cancel the user's account. Users must protect and keep account passwords and must not disclose them to third parties. The user must not allow other users to access the service through the user's account, nor can they use other users' accounts to access the service. The user is responsible for all operations performed through the user's account through any device. If the user suspects that another user is using his account, he/she should notify Lovepik immediately. If the user believes that the user has violated these terms, Lovepik may suspend or cancel the user's account. Lovepik personal accounts are limited to personal use and cannot be used on multiple devices at the same time. They also limit the frequent use of multiple devices. Lovepik (Lovepik.com) images from original sources, CC0 photos and user-uploaded VRF protocol images. The original material is a work created by a contract designer and uploaded to the original platform. If the user complies with the terms of the agreement, the user may use the original material for commercial purposes, but the user may not authorize the original work again. If there is a portrait of a real person in the original artwork, the portrait will be displayed as a template and the user should replace the portrait for use. If the user can reach the portrait person and gain portrait authority, the user can use the portrait without changing the portrait. On Lovepik you can search for a picture with portrait rights. We have the right of the portrait of the model and you can use the portrait with reasonable authorization. The "CC0" photo is defined as a public share property, and the creator has given up the copyright, so the "CC0" photo can be used for commercial purposes. In any case, including the downloaded photos or redesigned photos, the user cannot claim ownership of the photo copyright. If there is a portrait of a real person in the photo, the portrait will be displayed as a template and the user should replace the portrait for their use. If the user can reach the portrait person and obtain the permission of the portrait, the user can use the photo without changing the portrait. For "CC0" photos, the website cannot monitor information about the copyright holder of the photo. If there is a problem of infringement, please contact us via the website message. For the user uploaded VRF protocol picture: Users should consciously abide by the Act of Rights and other relevant laws and regulations, and shall not infringe the legitimate rights and interests of this site and right holders. Infringement users and infringers shall bear full responsibility for the losses of infringing users and third parties. Lovepik encourages users to supervise the works on the website. Lovepik will conduct investigations in the event that the right holder files allegations of copyright infringement and produces sufficient copyrighted documents. The infringing works will be deleted within a few days after they are confirmed. Lovepik is entitled to download pictures through the official website when each account meets certain conditions. However, as a web site administrator, Lovepik has the right to protect the security of the account while giving certain download restrictions, and does not assume legal responsibility. No one may use download resources to download without permission; you may not copy or imitate websites or non-production servers to create images, grow logos, source code and all page layout designs, copyrights are not authorized and may not be used for anything other than growth website. All users enter the new word homepage and have read the terms of this agreement carefully and fully agree. Please understand! If the copyright owner discovers that his work has been infringed, any unit or individual who files a complaint with Lovepik shall submit the name, telephone number, identification, title certificate, specific link (URL) and infringement details to the Copyright Complaints Report Channel. Lovepik will To the relevant report documents, if the situation is true, the measures of deletion, blockade and disconnection will be taken within 48 hours to remove the allegedly infringing content. The user acknowledges and agrees that the use of this site and its services is at the user's own risk and is the responsibility of the user, and therefore Lovepik shall not be liable for any misuse or use of the site in violation of these terms. The user will be liable for any damages to Lovepik caused by the user's use of the site and services, and violates the terms and accepts any liability that Lovepik may incur as a result of the user's violation of these terms. Lovepik does not warrant the availability or continuity of the Websites and Services, nor does it guarantee their reliability, quality, completeness, accuracy or suitability for any particular purpose or activity. · Interruption of telecommunication networks or non-Lovepik-owned user equipment, viruses, technical issues, interference, omissions, unavailable, outages, failures. · Web sites and services are delayed or unusable due to internet, bugs in the communications network or the power grid, or overloaded traffic. · Websites and services are unavailable due to maintenance or software updates. · Any other events beyond Lovepik's direct control. Retaining Lovepik's irresponsible misconduct and the circumstances that arise as a result of the nature of the user’s particular circumstances or matters, the applicable law requires that the liability cannot be limited by the agreement, and the use of this site and the service is solely due to the use of the site and services. The user and Lovepik are not responsible for any kind of damage caused to the user. The terms in this section (“Order Terms”) govern any subscription on any purchase site. Upon completion of any subscription purchase process, it should be assumed that the user has read and accepted the subscription terms without exception. These subscription terms are available to users prior to purchase order and can be stored or copied on durable media. If users are interested in purchasing any subscription, they must follow the instructions provided on the website at any time. Content available in the Premium selection The available subscriptions are provided in websites containing relevant information, prices and conditions (including, but not limited to, the number of downloads per day of Lovepik content). Lovepik may modify the subscriptions provided at any time, provide new services (unless otherwise stated, these subscription terms apply) or stop providing any services. 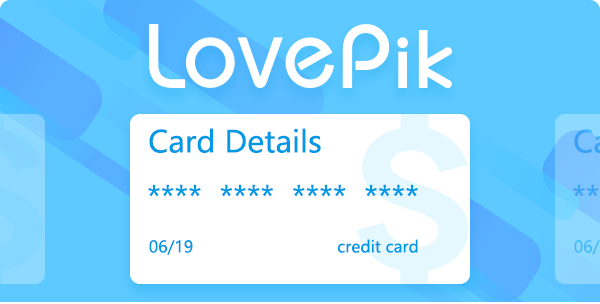 Subscriptions are personal and may not be transferred to third parties, nor may third parties other than users use Lovepik content (including as a third party, for which purpose an affiliate or entity belongs to the same group of companies). The subscription price is stated on the website in U.S. dollars and includes the relevant VAT (if applicable). Lovepik reserves the right to modify the price of any subscription at any time. When the user submits a subscription order, Lovepik shall apply the price specified on the website. As stated on the website, users should pay for subscriptions in advance through Paypal or credit cards. To purchase and pay for subscriptions, users should follow the instructions on the website. The processing of payment information and data through Paypal or credit card is conducted within a third-party website. When ordering any subscription, the user authorizes Lovepik to charge the corresponding price via the selected payment method. Subscriptions will not be activated until Lovepik receives payment or payment is authorized by the relevant financing entity. After that, the subscription will be valid for the period of the user's purchase. Since Lovepik content is digital content, cancellation rights do not apply without affecting the guarantees that may apply in consumer laws. Once your premium membership is activated and you download less than 3 pictures, you will have 15 days to order a refund. You can ask for a refund and contact us at lovepikvrf@gmail.com and we will begin the refund immediately after you submit your cancellation request. How you handle refunds depends on your original payment method: If you pay by credit or debit card, a refund will be sent to the issuing bank. Please contact the issuing bank to inquire about when the credit card was posted to your account. Because the content is digital content, the right of cancellation does not apply without affecting the guarantees that may apply in consumer laws. If any of these terms are declared invalid or unenforceable, they should be considered as not being included. In any case, the remaining clauses in these terms are not affected. Tips: Please use the unlimited download account reasonably. If a malicious download is frequent, the account download function will be suspended. The online merchant is located in Malta. This payment will be billed to the card you specified. The name on the statement will be 'LOVEPIK.COM'. Is payment having a problem?